US President Donald Trump today signed a revised executive order imposing a 90-day travel ban on visitors to the United States from six Muslim-majority countries. Note : This new order affects six of the seven countries included in the first executive order but leaves out Iraq. North Korea today announced that it has temporarily banned Malaysians from leaving the country. This comes amid rising tensions between the two countries over the assassination of North Korean leader Kim Jong-un's half-brother Kim Jong-nam in Malaysia. Zimbabwe's High Court has banned corporal punishment for children prohibiting parents and teachers from spanking, hitting or subjecting children to any type of physical punishment. The Israeli government has voted in favour of decriminalising recreational use of Marijuana. Union Cabinet has approved the signing of Memorandum of Understanding (MoU) between India and the United Nations Entity of Gender Equality and the Empowerment of Women (UN-Women). Under this MoU, Union Ministry of Panchayati Raj (MoPR) and UN-Women will work in collaboration with each other to promote participation of women in Panchayati Raj Institutions (PRIs). The Union Cabinet has approved signing of the Definitive Agreement on Oil Storage and Management between Indian Strategic Petroleum Reserve Ltd (ISPRL) and UAE’s Abu Dhabi National Oil Company (ADNOC). This move aims at boosting India’s energy security by ensuring a strategic storage flow in for crude oil, from a government firm in Abu Dhabi for meeting unexpected future exigencies. The Union Cabinet has also approved an MOU between India and United Arab Emirates (UAE) to provide various services in the field of energy management and conservation. The MoU was signed between the National Productivity Council (NPC), an autonomous body under the Department of Industrial Policy & Promotion (DIPP), Ministry of Commerce and Al Etihad Energy Services UAE. Metro stations in Noida are set to offer commuters the chance to rent bicycles for short trips. Commuters will have to submit certain details and use their metro smart cards to rent the bicycles. 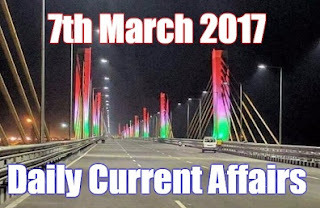 PM Narendra Modi today inaugurated India's longest Cable Bridge (1.4-kilometre) on River Narmada at Bharuch (Gujarat). The Union Cabinet has given its approval for India’s accession to the Customs Convention on International Transport of Goods under cover of TIR Carnets (TIR Convention) and necessary procedures for ratification. By joining the convention, Indian traders will get access to fast, easy, reliable and hassle free international system for movement of goods by road or multi-modal means across the territories of other contracting parties. Actor Anupam Kher has been nominated as the non-official member of NCC's Central Advisory Committee. Indian Institute of Science (IISc), Bangalore has become India's first university to be ranked among the world's top 10. IISc Bangalore was ranked eighth in the recently released Times Higher Education Rankings of the world's top 10 small universities hosting less than 5,000 students. The top university continues to be the California Institute of Technology, widely known as Caltech. GMR Hyderabad International Airport has been ranked first in the world in the highest passenger handling capacity category by the Airports Council International’s Airport Service Quality survey. The airport, running into its ninth year of operations, is designed to cater to 1.5 crore passengers per annum. The second position has been held by Delhi's Indira Gandhi International Airport. China's banking system has surpassed that of the Eurozone to become the world's largest by assets. The government has urged banks, including private entities to reconsider their move to impose charges on cash transactions and ATM withdrawals after certain limits. Banks have imposed such charges to limit cash transactions. Government further asked SBI to reconsider its decision of imposing a penalty on non-maintenance of monthly average balance in accounts from April 1. Bengali folk singer Kalikaprasad Bhattacharjee (56), known for his band 'Dohar', passed away today. He was known for popularising folk songs of rural Bengal through his albums. IBM has announced an industry-first initiative to build commercially available universal quantum computing systems. 'IBM Q' quantum systems and services would be delivered via the IBM Cloud platform. Pakistani cricketer, Kamran Akmal was named the best batsman, the best wicketkeeper and the best player of the Pakistan Super League 2017. Akmal was PSL's top scorer with 353 runs in 11 innings, with a highest score of 104, best for any batsman in the tournament. Akmal, with 12 dismissals, was also the wicketkeeper with most dismissals in PSL 2017. Indian spinner Ravichandran Ashwin became India's fifth-highest wicket taker in Tests after going past Bishen Singh Bedi's tally of 266 Test wickets on the fourth day of the second Test today. Former Brazilian footballer Ronaldinho is set to be a part of the coaching staff at China's upcoming youth football academy, which is modelled on FC Barcelona's La Masia academy.